Mapping innovations developed by ARS researchers use data about soils, plant communities, and other ecological characteristics to generate science-based assessments of rangeland conditions that help land managers evaluate the potential for successful restoration efforts. Agricultural Research Service (ARS) scientist Brandon Bestelmeyer and others used a variety of ecological data to map environmental factors that affect landscape restoration efforts. The finished maps are called "ecological state" maps. ARS is USDA's chief intramural scientific research agency, and this work supports the USDA priority of responding to climate change. Bestelmeyer's team paired soils data and vegetation maps with state-and-transition models (STMs) to generate science-based assessments of rangeland conditions across landscapes. STMs describe the types of plant communities that can occur on a specific soil type. Sometimes beneficial plant communities have persisted despite environmental challenges. Other times these plant communities have been so altered by invasive plants, soil degradation, or other processes that they require management interventions—reseeding, herbicide treatments, changes to grazing, or other approaches—in order to be restored, if they can be restored at all. The team used approximately 6 million acres in southwestern New Mexico for their study. This area features large expanses of desert grassland, savanna, and shrubland. But native shrubs have been encroaching on areas previously covered by perennial grasses, and erosion has degraded soils throughout much of the region. The researchers used variations in woody cover density, perennial grass cover, and soil erosion to develop general "ecological state" categories for plant communities. The team then gathered information on "ecological site" categories in the study area that vary in potential productivity due to climate and soils. 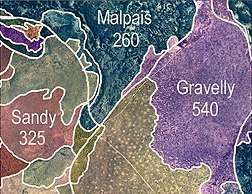 Combining these classifications yielded eight distinct "ecological state" categories that were mapped using digital soil maps, aerial imagery, and field data. These maps can be used for assessing an ecological site's condition and potential for successful restoration. The final maps delineated "ecological state" areas ranging in size from a few acres to 10,000 acres throughout southwestern New Mexico. These maps are being used for communication and planning by the U.S. Bureau of Land Management. Bestelmeyer, who works at the ARS Jornada Experimental Range in Las Cruces, N.M., published results from this project in 2012 in Rangeland Ecology & Management.